The Arts Club Theatre Company is presenting the Tony-award winning musical Hairspray from May 12 until July 10, 2011. 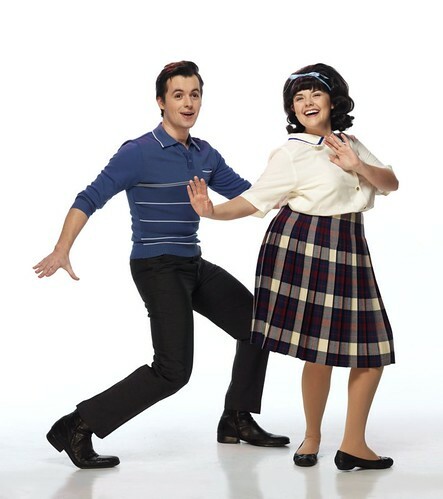 Adam Charles and Jennie Neumann in the Arts Clubâ€™s production of Hairspray. Amidst the doo-wop and sock-hops of â€˜60s Baltimore, pleasantly plump Tracy Turnblad wonâ€™t let popular Amber Von Tussle squash her dream of dancing on a local TV teen variety show. Can a girl with big ideas (and really big hair!) change the worldâ€¦and win the heart of dreamy Link Larkin? Welcome to the â€˜60s! Director Bill Millerd says Jay Brazea was born to play the role of Tracy’s mom Edna (a female role typically played by an actor in drag) and it’s a just really fun show – the type that will leave you smiling. Tickets for the production at the Stanley Theatre are available now, starting at $29. I will draw one winner at random from all entries at 10:00am on Monday, May 16th. Update The winner is Victoria! I love Hairspray – such an amazing musical! Would take my boyfriends aunt, who is down here right now for radiotherapy. I have plans to go to a show in North Vancouver in June. Thia would be a nice addition to that. Ahhhh! Jay Brazeau will be brilliant at Edna!!! I’ve never seen this – live or the movie – but have always wanted to! My wife’s BD is coming up and she would love this show. Be fun to see Hairspray! I have never seen Hairspray live or in movie form, so this would be a great experience! I would love to go see this with my mom! I love Hairspray. Love It!!!! would love to see this musical!!!! Love to see this one. I have heard this is a great show. I hope I win. I love live theatre – would be nice to see something besides Shakespeare! Yes, I want to win these tickets! I’d love to take my daughter to this. We know allll the songs! Musical theatre is always enjoyable. I have tickets to WICKED, would love some to Hairspray! Looks like lots of fun! I love musicals! I loved this movie when I was a kid. Fingers crossed. I love Arts Club musicals! loved it the first time i saw it in nyc… would love to see it again! it’s a great show! I’ve never seen this on stage, only the movie, but I know it would be a million times better! Would be amazing to check this out. Would love to take my mom to Hairspray!!! Looks like fun. I would love to take my Mom to this! Would love to see Hairspray! I love all musical theatre…I would love to see Hairspray! Would love to take my mom to see this! Vancouver had had some great shows lately… I sure hope I can see this one! I love the recent re-make of the film: John Travolta and Christopher Walken made an amazing couple! *pokes Aileen* 😀 This would be so much fun to see! I love the brillance of John Waters. Polish your saddle shoes we are in for a good time! I can’t even imagine how fun this would be live. I’ll even see it without Travolta! Oh i would love to see this live! My stepdaughter would LOVE to see this! I saw Hairspray when it was on Broadway, would love to see what they do here! Love Hairspray and love free contests! My mom would really enjoy this show! I love hairspray. love the music! First Wicked, then Lion King. I’d love to see Hairspray as well. I’ve never seen this yet, so I would love to win this! My girlfriend would like this. This looks like so much fun! Thanks for running the contest. Sweet! I’d love to win those! I saw Hairspray on Broadway in NYC 4 years ago and would love to see it again! would love to see more plays in Vancouver! Sounds fun – the Arts Club really does some good shows! I a definitely going to purchase tickets!! (or win them?!) 🙂 Love Hairspray! Love the movie version. Bet the play is even better! great show – the musical will be so much fun! I’ve never seen Hair Spray… Would be a lot of fun. Just finished performing in The Drowsy Chaperone. Loved the movie! It would be great to see it live. would love to see it in theatre! Please count me in! I’ve never been to the Arts Club. I absolutely adore musicals and have never seen this one! would be amazing to see a live musical, it’s been ages! I haven’t seen a musical in years, would be a great experience I bet! this would be such a treat. SQUEEEEEEEE! I’ve never seen this live and would LOVE a chance to go! I’ve only seen Hairsray the movie and would love, love, LOVE to see the arts club production live. So fun! The Arts Club never ceases to do a great job! I’d love to see this!! I’d so love to see this! My girls love this show!